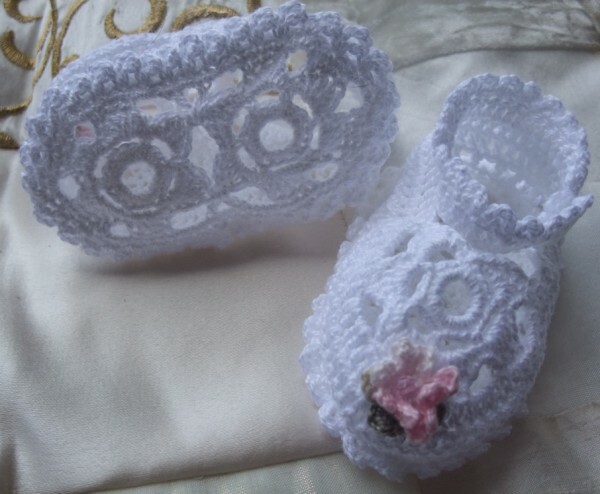 #ANGEL SHOES 134 ANGEL SHOES 134..WHITE THREAD CROCHET BABY CHRISTENING SHOES 0-3MTHS. 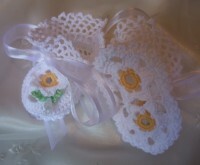 SIZE 8CMS. 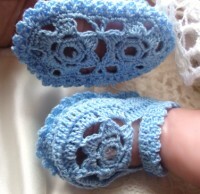 FO FIT ABOUT 0-3 MTH BABY. 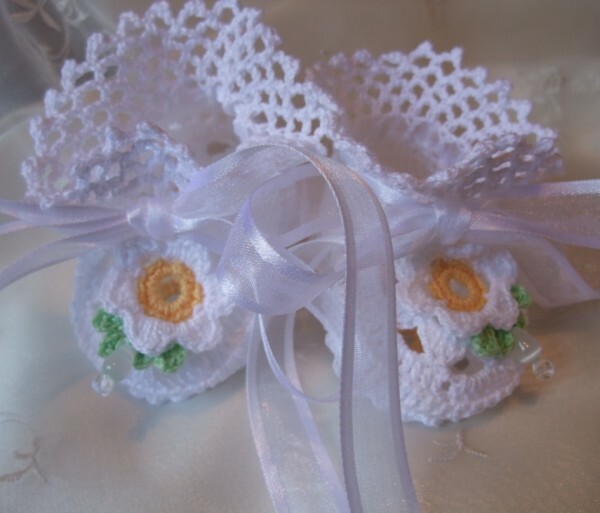 #ANGEL SHOES 137 ANGEL SHOES 137..WHITE DAISY THREAD CROCHET CHRISTENING SHOES 0-3MTHS. BEAUTIFUL SOFT WHITE COTTON THREAD BOOTIES SUITABLE FOR A SMALL BABY OR A REBORN DOLL FOR A CHRISTENING SPECIAL OCCASION . 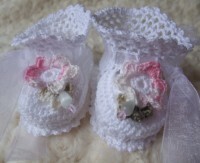 AVAILABLE IN 4 SIZES, SMALL PREM, SMALL NEWBORN, 0-3 MONTHS & 3-6 MONTHS. 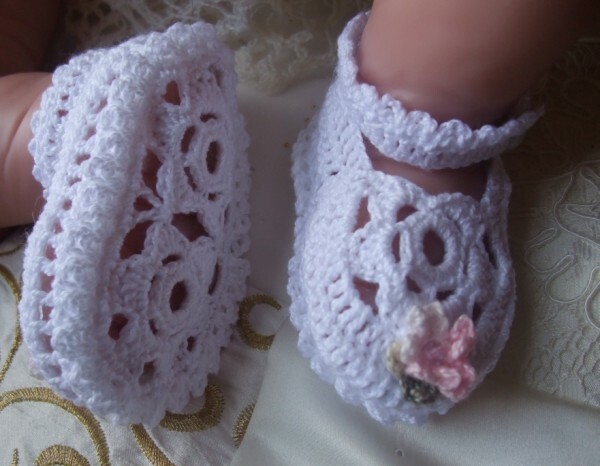 #ANGEL SHOES 138 ANGEL SHOES 138..WHITE THREAD CROCHET BABY/CHRISTENING SHOES 0-3MTHS. 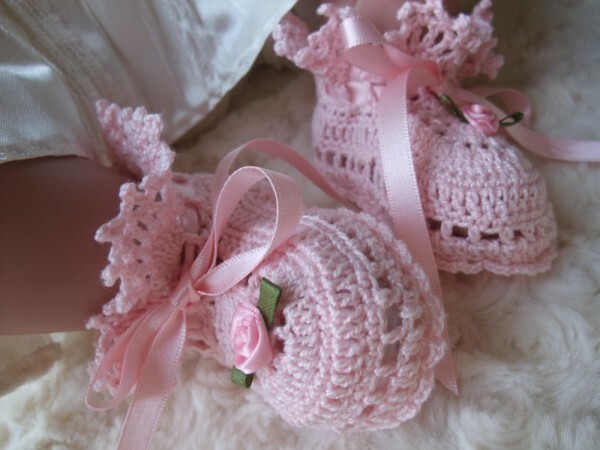 0-3 MONTHS AND 3-6 MONTHS. 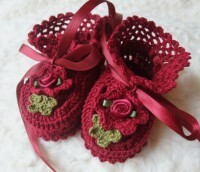 #ANGEL SHOES 140 ANGEL SHOES 140.. RUBY RED THREAD CROCHET BABY SHOES 0-3MTHS. BEAUTIFULï¿½DEEPï¿½RUBY REDï¿½COTTON THREAD BOOTIES SUITABLE FOR A BABY OR A REBORN DOLL . TO FIT ABOUT 0-3 MTH BABY. 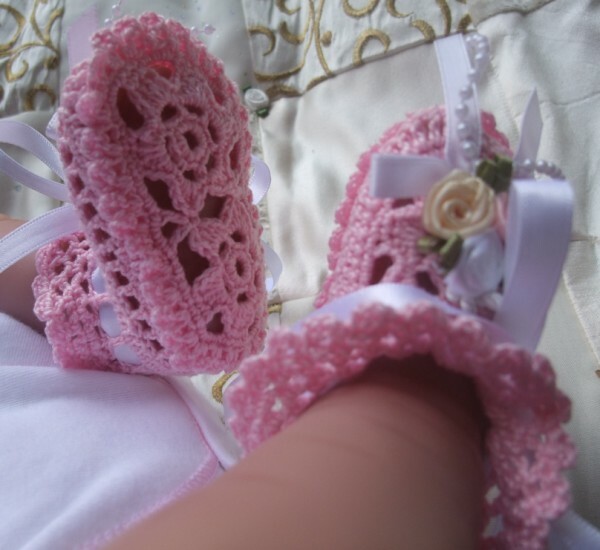 ANGEL SHOES 007.. 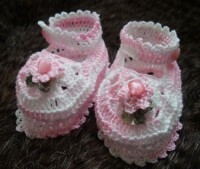 PALE PINK THREAD CROCHET MARY JANE STYLE BABY SHOES 0-3MTHS. 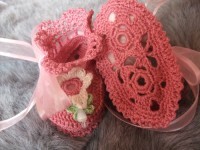 SWEET LITTLE MARY JANE STYLE CROCHET SHOES WITH AN ANKLE STRAP. 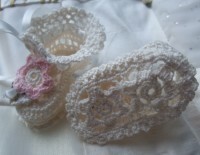 MADE IN PALE PINK/WHITE VARIGATED COTTON CROCHET THREAD, AND TRIMMED WITH A CROCHET FLOWER AND LEAF AND SMALL HEART BEADS. PERFECT FOR A SMALL BABY OR REBORN DOLL. 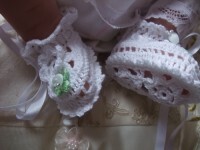 TO FIT ABOUT 0-3 MONTH SIZE. 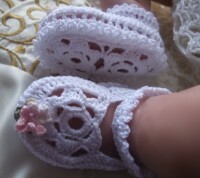 #ANGEL SHOES 008 ANGEL SHOES 008.. WHITE THREAD CROCHET MARY JANE STYLE BABY SHOES 0-3MTHS. 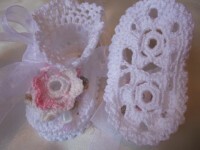 MADE IN WHITE COTTON CROCHET THREAD, AND TRIMMED WITH A PINK CROCHET FLOWER AND LEAF AND SMALL CRYSTAL BEADS. 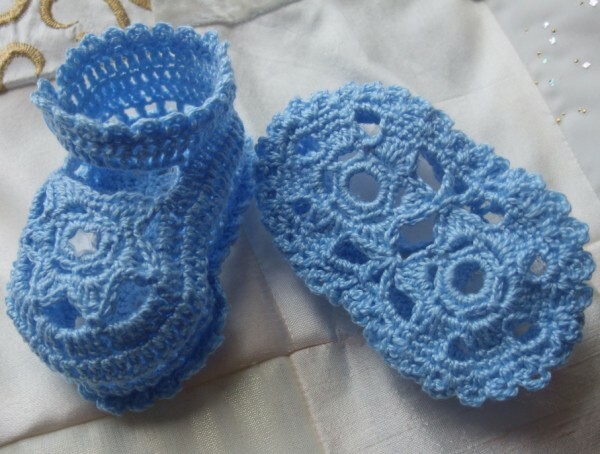 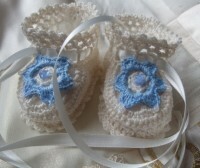 #ANGEL SHOES 011 ANGEL SHOES 011.. BLUE THREAD CROCHET BABY SHOES 0-3MTHS. 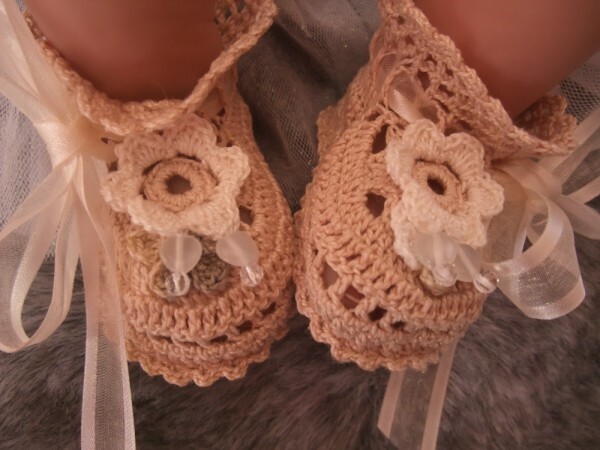 SWEET LITTLE CROCHET SHOES WITH AN ANKLE STRAP. 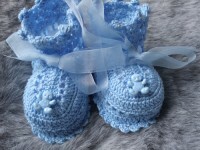 MADE IN BLUE COTTON CROCHET THREAD AND TRIMMED WITH A LITTLE STAR BEAD.  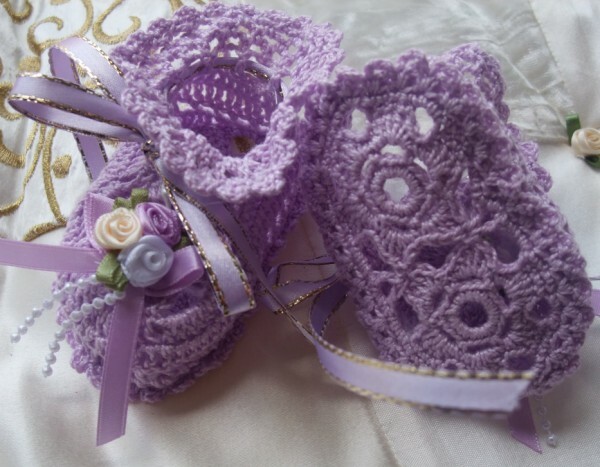 MADEï¿½IN LILAC COTTON CROCHET THREAD, AND TRIMMED WITH SATINï¿½ POSETTES AND GOLD EDGED SATIN RIBBONS. 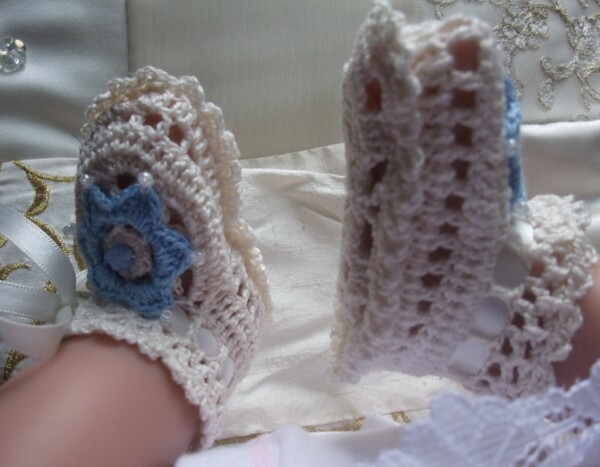 #ANGEL SHOES 118 ANGEL SHOES 118.. 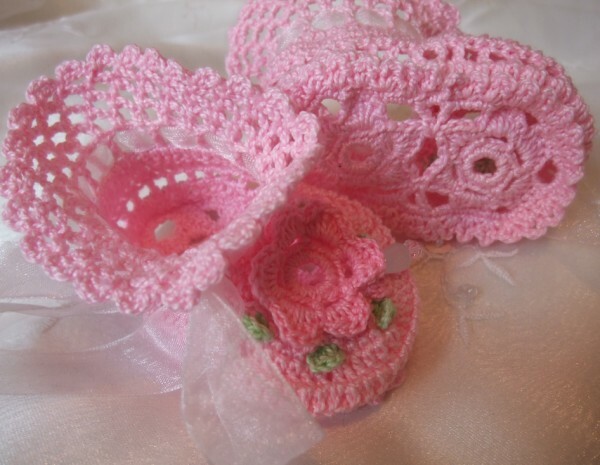 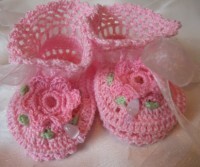 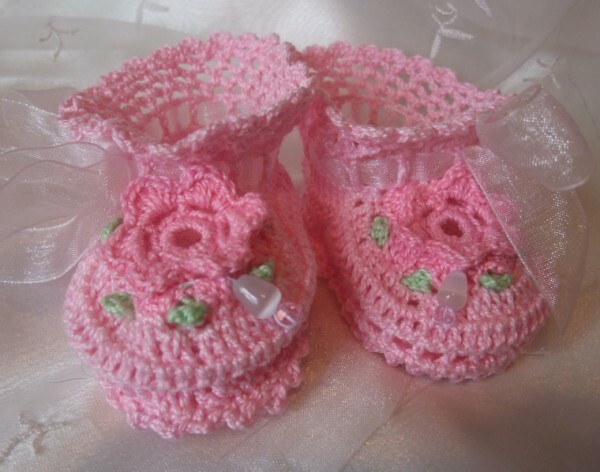 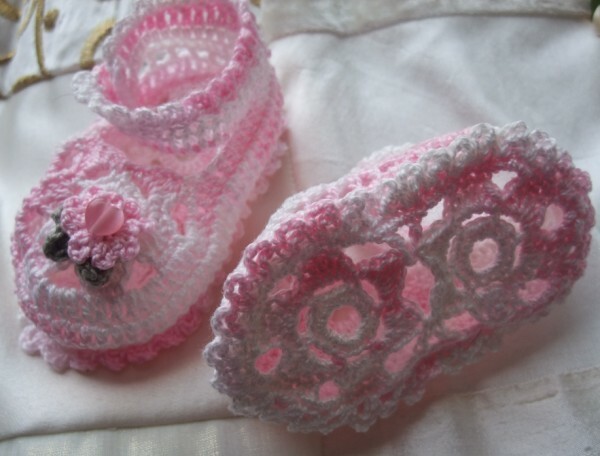 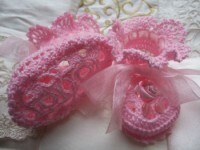 PALE PINK THREAD CROCHET BABY SHOES 0-3MTHS. 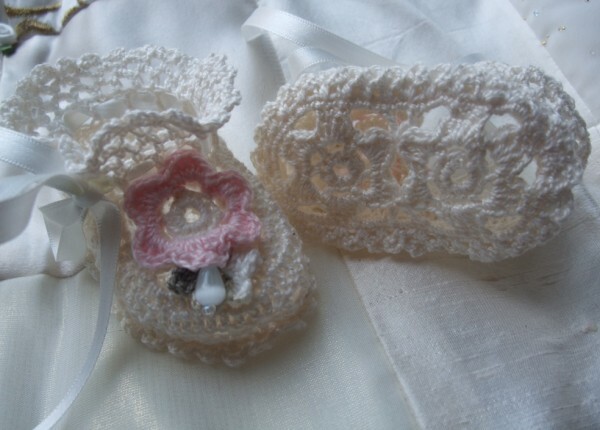 MADE IN PALE PINK COTTON CROCHET THREAD, AND TRIMMED WITH A SMALL ALL PINK SATIN FLOWER FASTENED WITH PINK ORGANZA RIBBONS. 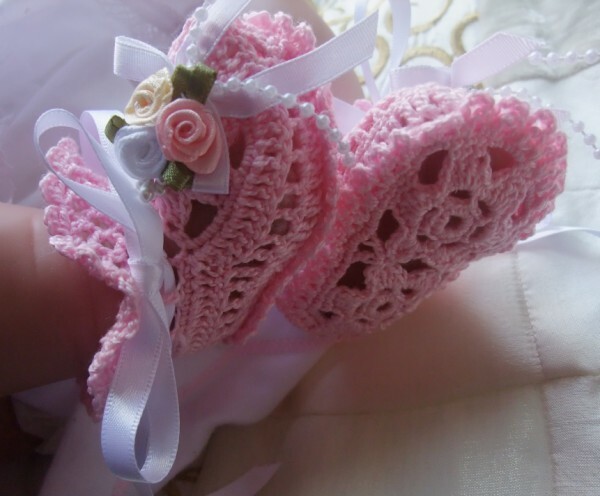 FANCY LACY SOLE. 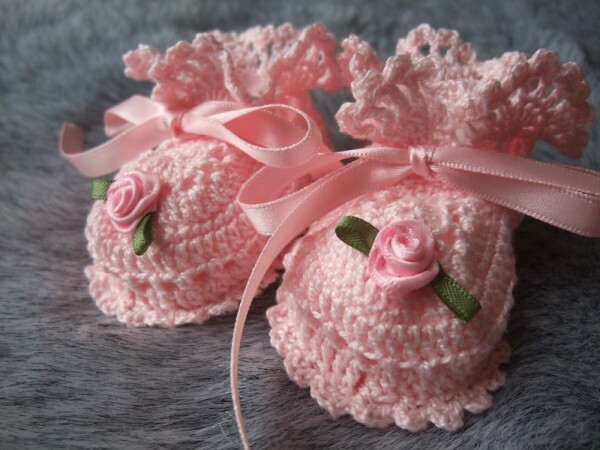 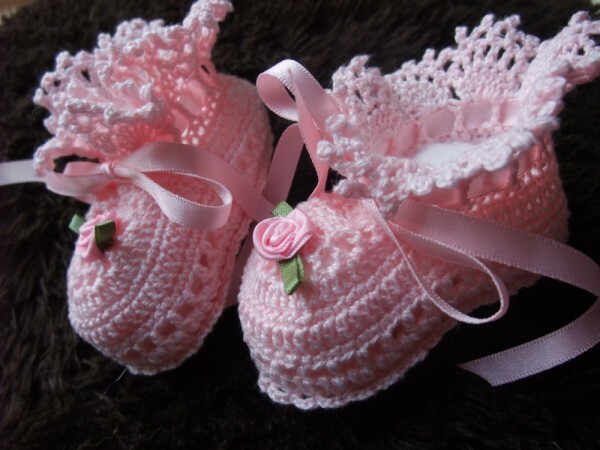 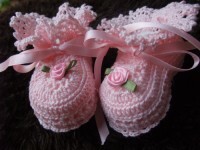 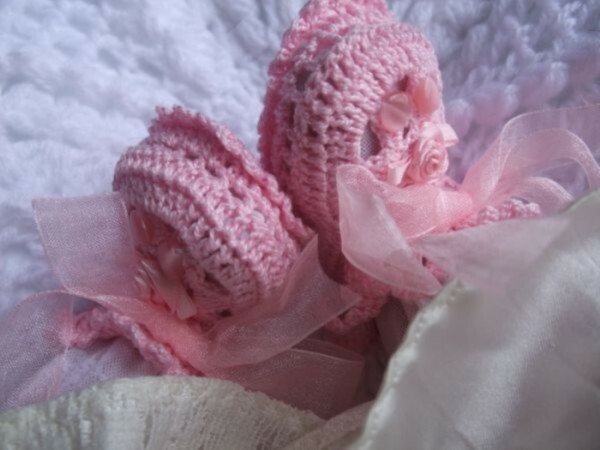 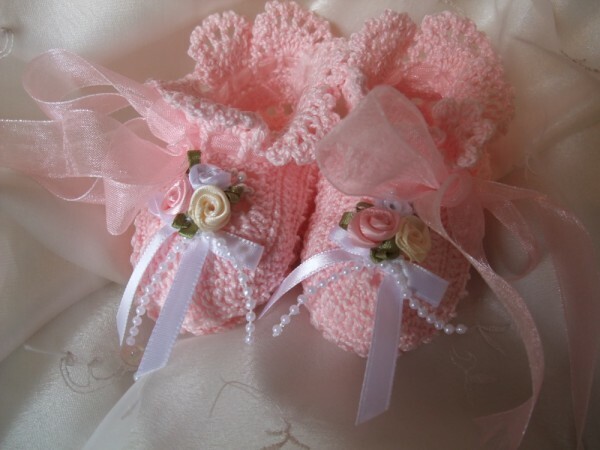 BEAUTIFUL SOFTï¿½PALEST PINKï¿½COTTON THREAD BOOTIES SUITABLE FOR A SMALL BABY GIRL OR A REBORN DOLL FOR A CHRISTENING SPECIAL OCCASION OR JUST BECAUSE YOUR BABY IS VERY SPECIAL! 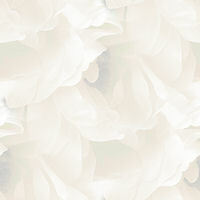 TRIMMED WITHï¿½ A LACY FRILL, LITTLEï¿½ SATIN ROSETTES AND FASTENED WITH ORGANZA RIBBONS. 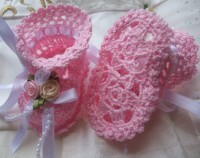 SIZE 8CMS TO FIT ABOUT 0-3 MTH BABY. 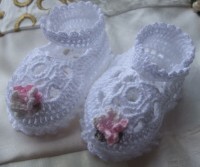 #ANGEL SHOES 122 ANGEL SHOES 122..WHITE THREAD CROCHET CHRISTENING SHOES 0-3MTHS. 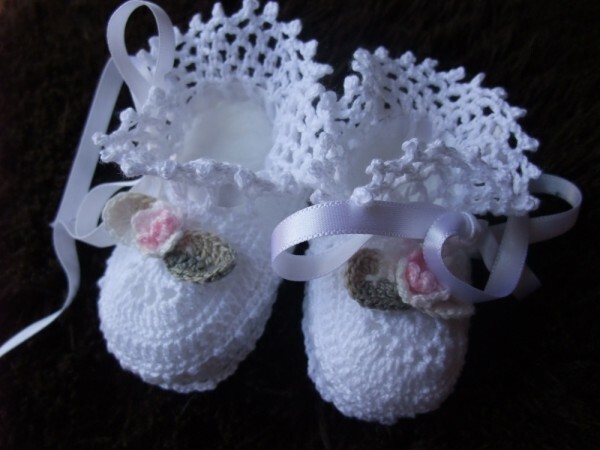 BEAUTIFUL SOFT WHITE COTTON THREAD BOOTIES SUITABLE FOR A SMALL BABY GIRL OR A REBORN DOLL FOR A CHRISTENING SPECIAL OCCASION OR JUST BECAUSE YOUR BABY IS VERY SPECIAL!! 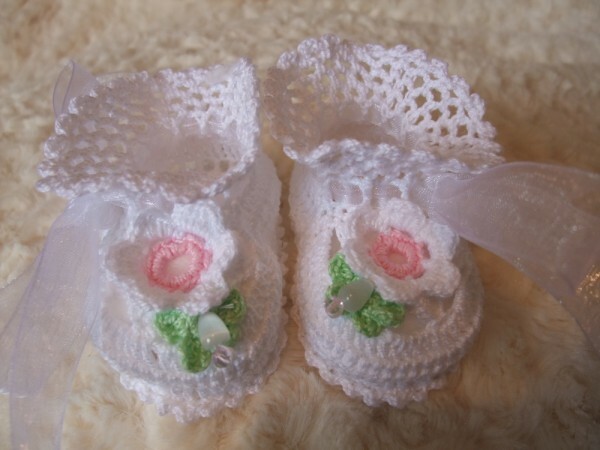 #ANGEL SHOES 123 ANGEL SHOES 123..WHITE THREAD CROCHET CHRISTENING SHOES 0-3MTHS. 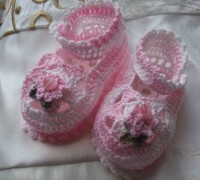 #ANGEL SHOES 124 ANGEL SHOES 124..PRETTY PINK THREAD CROCHET BABY SHOES 0-3MTHS. 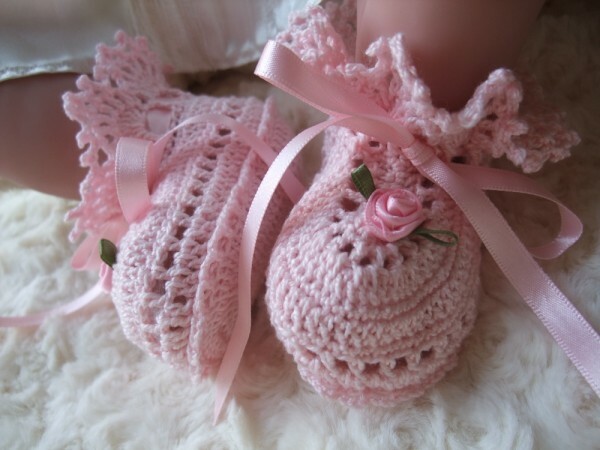 BEAUTIFUL PETUNIA PINK COTTON THREAD BOOTIES SUITABLE FOR A SMALL BABY GIRL OR A REBORN DOLL . 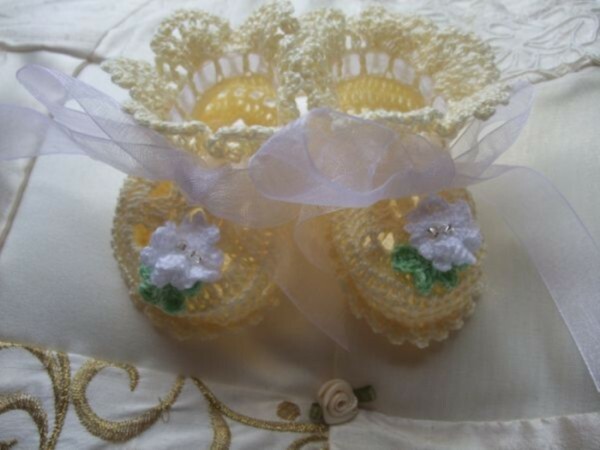 #ANGEL SHOES 125 ANGEL SHOES 125..PRETTY IVORY THREAD CROCHET BABY SHOES 0-3MTHS. 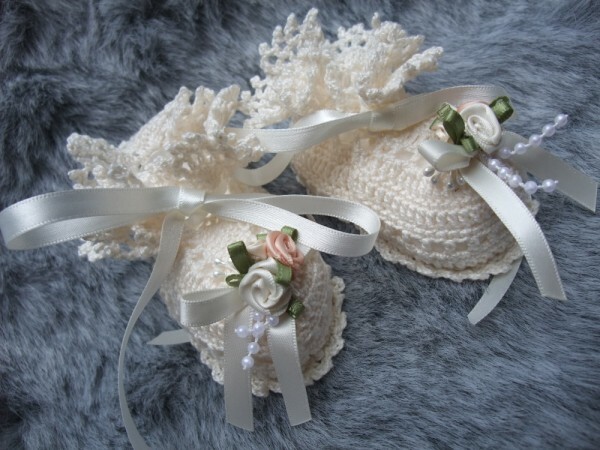 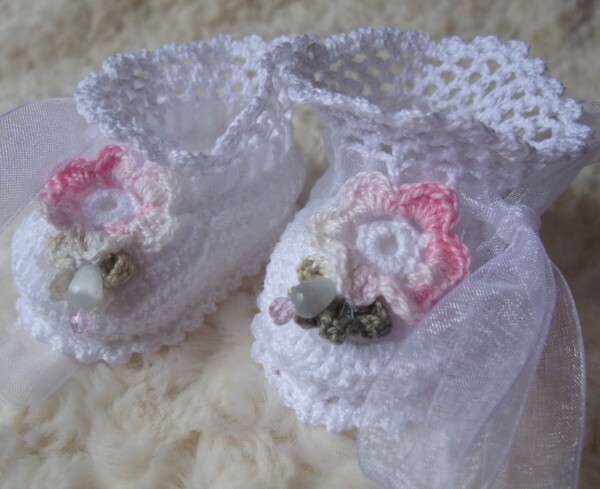 BEAUTIFULï¿½IVORY COTTON THREAD BOOTIES SUITABLE FOR A SMALL BABY GIRL OR A REBORN DOLL . 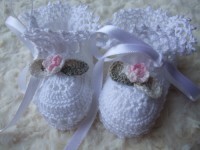 #ANGEL SHOES 126 ANGEL SHOES 126..DOUBLE CREAM THREAD CROCHET BABY SHOES 0-3MTHS. 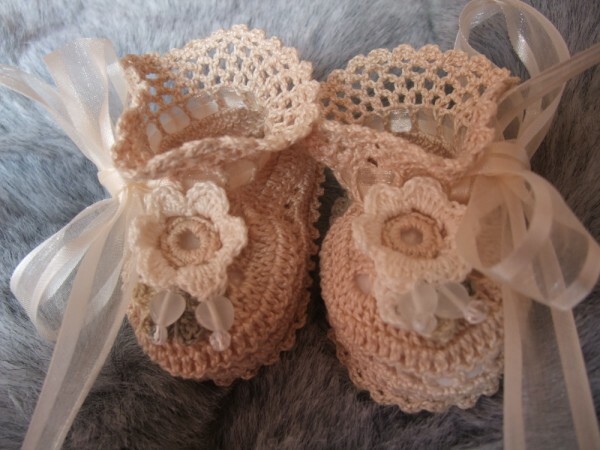 BEAUTIFUL DEEP CREAM COTTON THREAD BOOTIES SUITABLE FOR A SMALL BABY OR A REBORN DOLL . 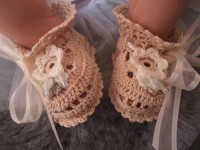 #ANGEL SHOES 127 ANGEL SHOES 127. 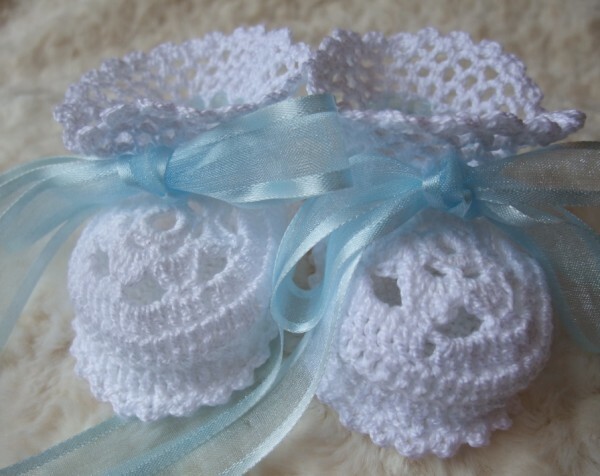 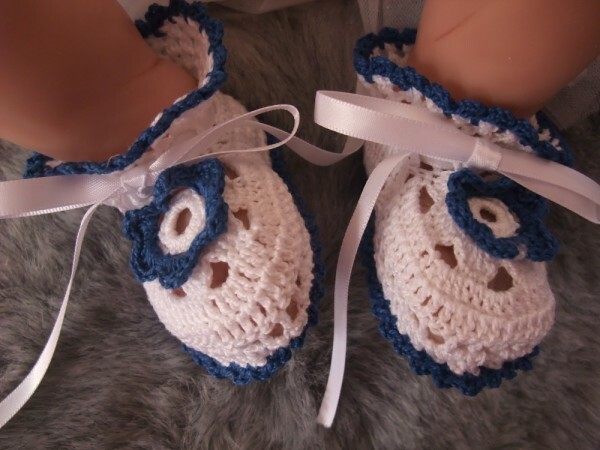 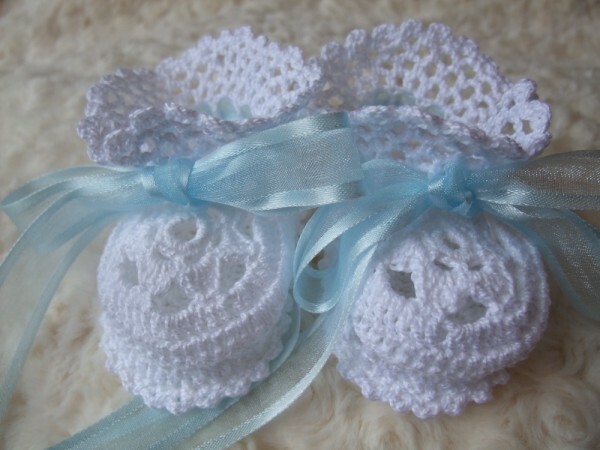 WHITE WITH BLUE THREAD CROCHET BABY SHOES 0-3MTHS. 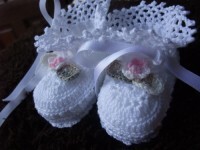 WHITE COTTON THREAD BOOTIES SUITABLE FOR A SMALL BABYï¿½(BOY OR GIRL)ï¿½OR A REBORN DOLL . 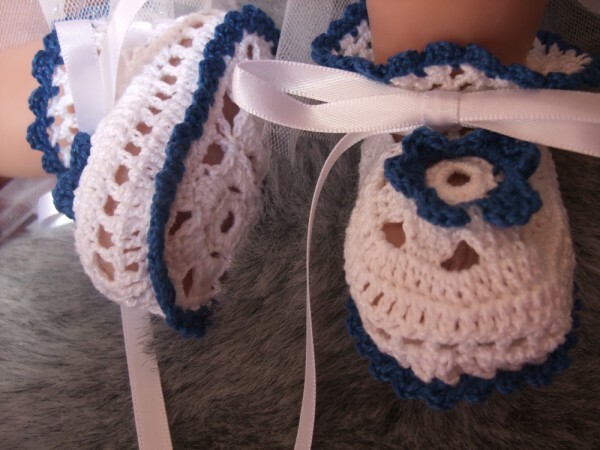 A SIMPLE STYLE TRIMMED WITH DEEP ROYAL BLUE, AND TIED WITH SATIN RIBBONS. 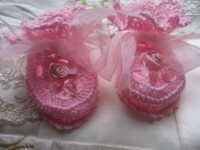 #ANGEL SHOES 128 ANGEL SHOES 128.. 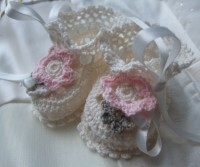 DUSTY PINK THREAD CROCHET BABY SHOES 0-3MTHS. 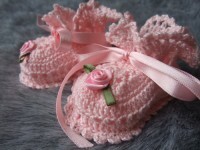 BEAUTIFUL DUSTY PINK COTTON THREAD BOOTIES SUITABLE FOR A SMALL BABY GIRL OR A REBORN DOLL . 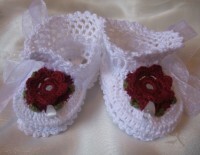 TRIMMED WITH A LITTLE IVORY CROCHET ROSE, LEAF AND DROP BEAD DETAIL, FASTENED WITH ORGANZA RIBBONS. 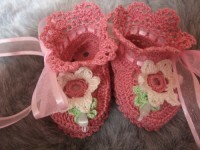 #ANGEL SHOES 130 ANGEL SHOES 130.. FUCHSIA PINK THREAD CROCHET BABY SHOES 0-3MTHS. 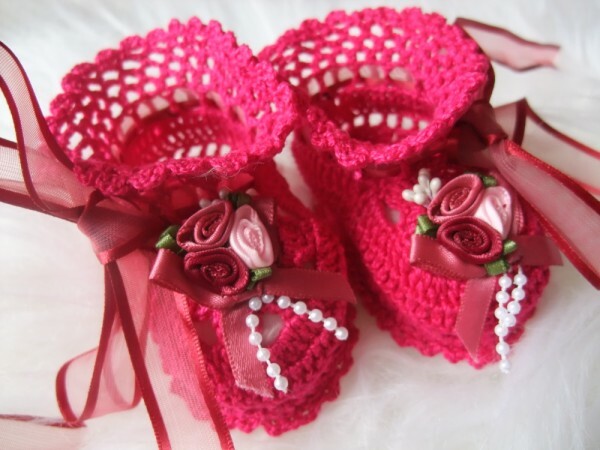 BEAUTIFULï¿½DEEP FUCHSIA PINKï¿½ COTTON THREAD BOOTIES SUITABLE FOR A SMALL BABY GIRL OR A REBORN DOLL . 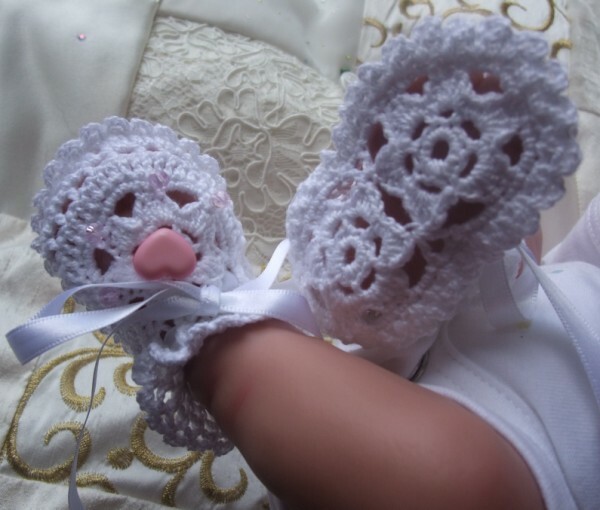 #ANGEL SHOES 131 ANGEL SHOES 131..WHITE DAISY THREAD CROCHET CHRISTENING SHOES 0-3MTHS. 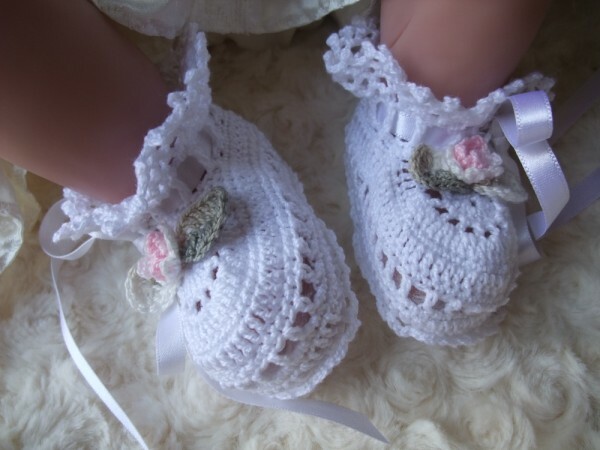 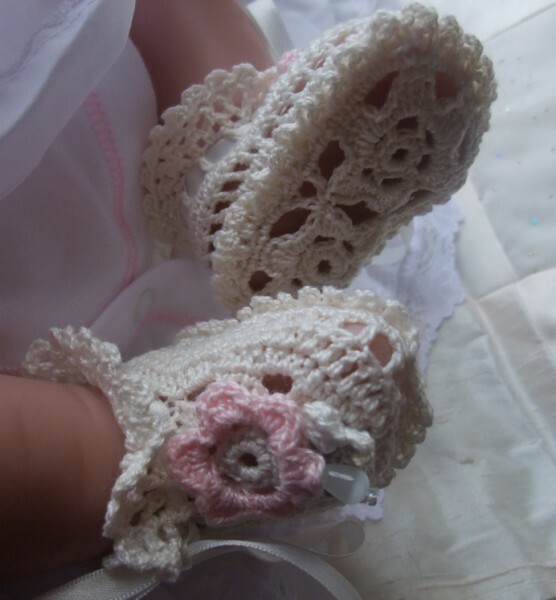 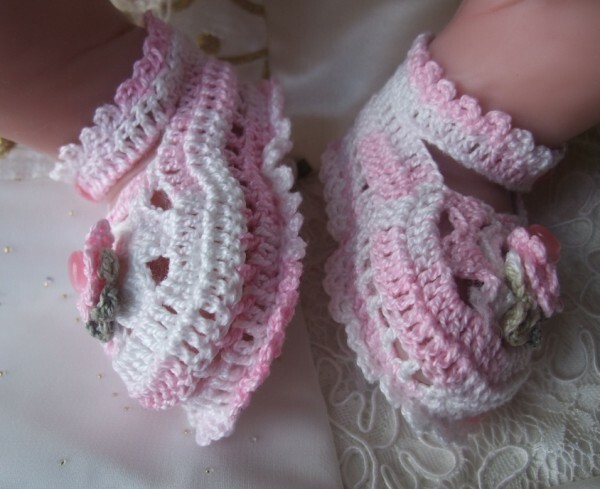 #ANGEL SHOES 010 ANGEL SHOES 010..IVORY ROSEY THREAD CROCHET SHOES FOR SMALL NEWBORN. GORGEOUS LITTLE THREAD CROCHET BOOTEES FOR A SMALL NEWBORN BABY. 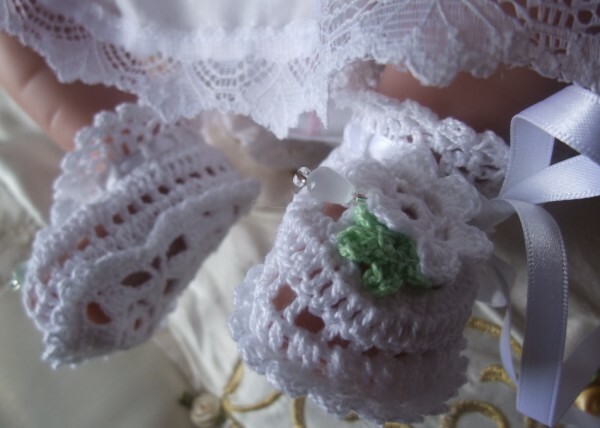 IVORY WITH A PALE PINK CROCHET ROSE, GREEN LEAF, AND A DROP BEAD, TIED WITH SATIN RIBBONS. 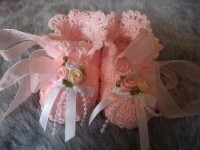 ï¿½PALE PINK CROCHET BOOTIES WITH A FANCY LACY SOLE, TRIMMED WITH SATIN ROSETTES AND TIED WITH SATIN RIBBONS. 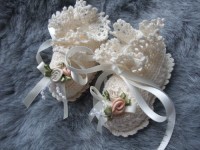 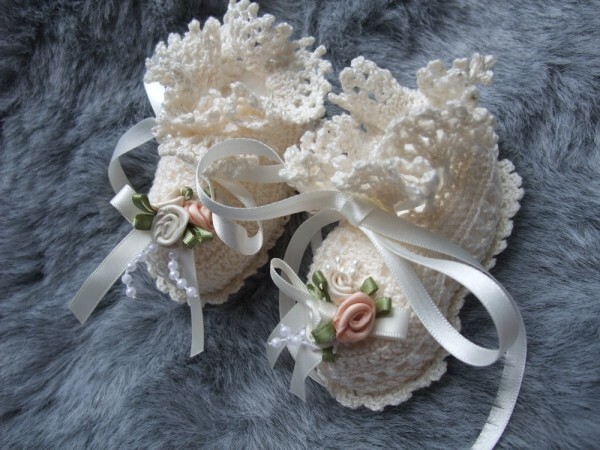 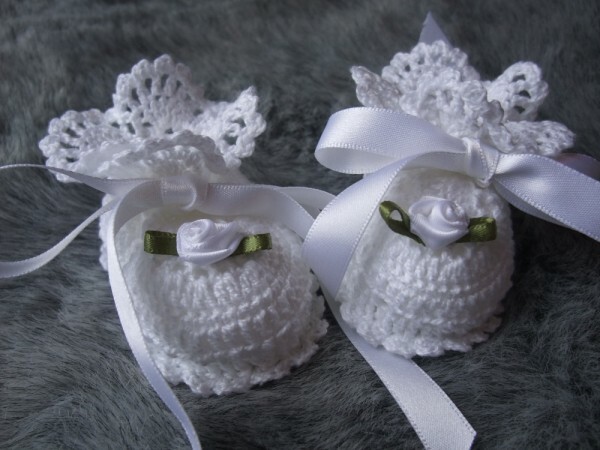 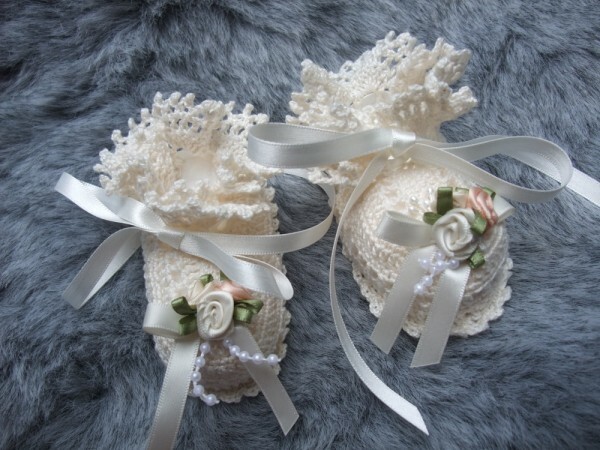 BEAUTIFUL SOFTï¿½IVORY COTTON THREAD BOOTIES SUITABLE FOR A SMALL BABYï¿½OR A REBORN DOLL FOR A CHRISTENING SPECIAL OCCASION OR JUST BECAUSE YOUR BABY IS VERY SPECIAL!! 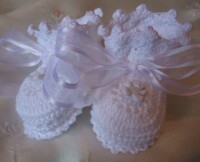 #ANGEL SHOES 117 ANGEL SHOES 117..WHITE THREAD CROCHET BOOTIES FOR SMALL NEWBORN BABY. 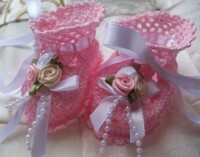 GORGEOUS LITTLE THREAD CROCHET BOOT1ES FOR A SMALL NEWBORN BABY. 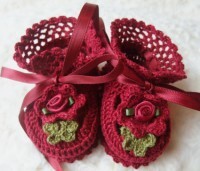 ï¿½SNOW WHITEï¿½ CROCHET BOOTIES WITH A FANCY LACY SOLE, TRIMMED WITH A CROCHET ROSE AND LEAF DETAIL WITH A DROP BEAD, AND TIED WITH SATIN RIBBONS. 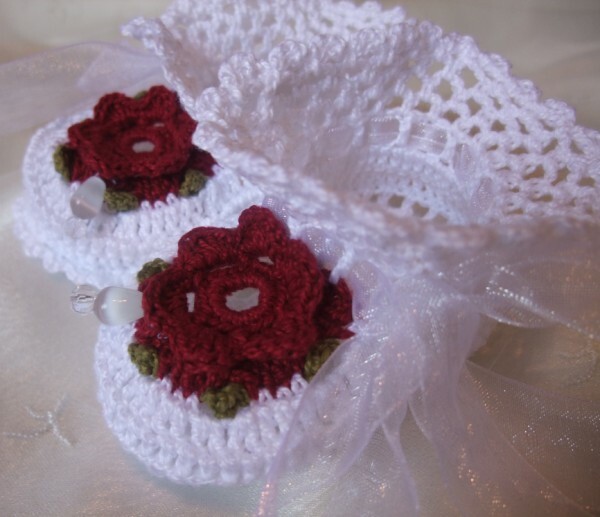 ï¿½VANILLA CROCHET BOOTIES WITH A FANCYï¿½TOP FRILL,TRIMMED WITH A CROCHET ROSE AND LEAF DETAIL WITH CRYSATL BEADS, AND TIED WITHï¿½ORGANZA RIBBONS. 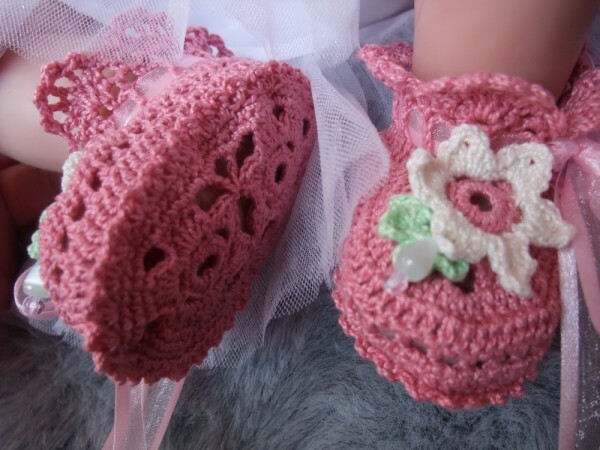 ï¿½SNOW WHITE CROCHET BOOTIES WITH A FANCY LACY SOLE, TRIMMED WITHï¿½A CROCHET PALE PINK ROSE AND GREEN LEAF WITH A DROP BEAD AND TIED WITH ORGANZA RIBBONS. GORGEOUS TINY THREAD CROCHET BOOTEES FOR A SMALL PREMATURE BABY. ï¿½WHITE CROCHET BOOTIES WITH A FANCY LACY SOLE, TRIMMED WITH A SMALL PINK HEART BUTTON AND TIED WITH SATIN RIBBONS. 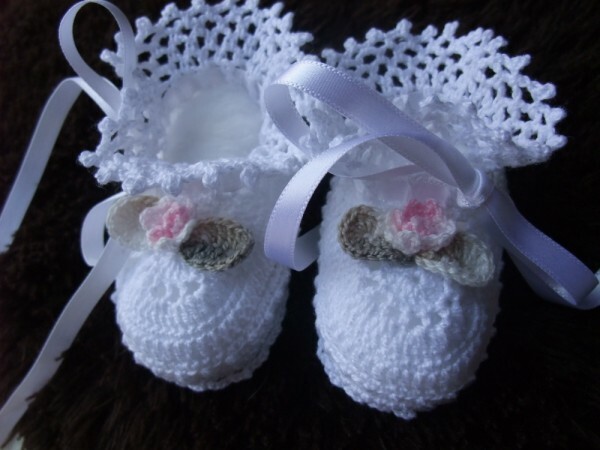 BEAUTIFUL SOFT IVORY COTTON THREAD BOOTIES SUITABLE FOR A SMALL BABY GIRL OR A REBORN DOLL FOR A CHRISTENING SPECIAL OCCASION OR JUST BECAUSE YOUR BABY IS VERY SPECIAL!! 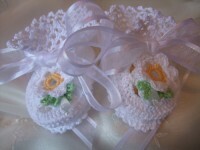 TRIMMED WITH SATIN ROSETTES AND FASTENED WITH SATIN RIBBON (DIFFERENT COLOURS ON REQUEST WITH ORDER). 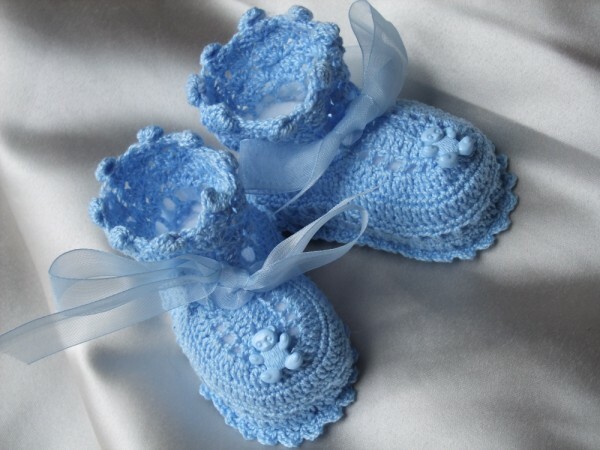 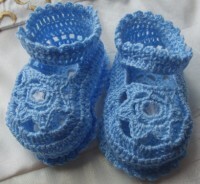 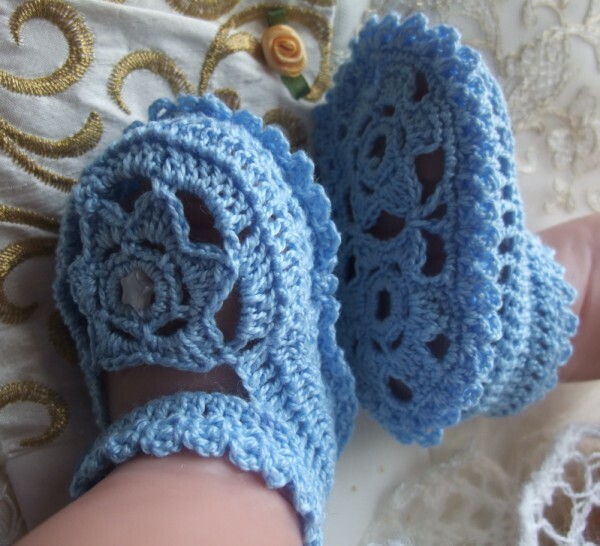 #ANGEL SHOES 003 ANGEL SHOES 003..ADORABLE LITTLE BLUE THREAD CROCHET SHOES FOR A BABY BOY 0-3 MTHS. 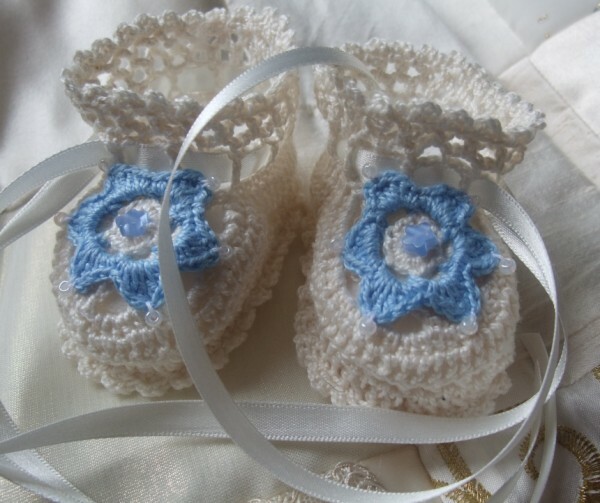 BEAUTIFUL SOFT BLUE COTTON THREAD BOOTIES SUITABLE FOR A SMALL BABY BOY OR A REBORN DOLL FOR A CHRISTENING SPECIAL OCCASION OR JUST BECAUSE YOUR BABY IS VERY SPECIAL!! TRIMMED WITH A LITTLE BLUE TEDDY BEARS AND FASTENED WITH ORGANZA RIBBON (DIFFERENT COLOURS ON REQUEST WITH ORDER). 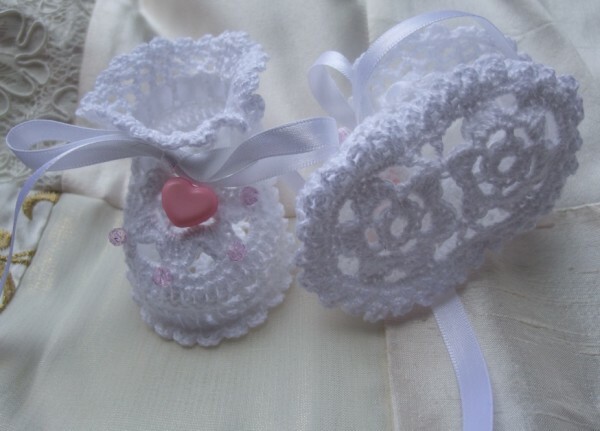 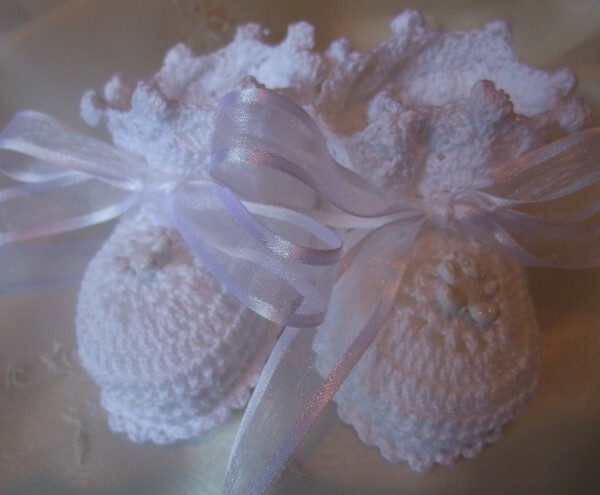 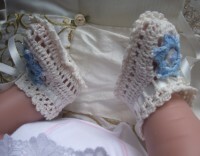 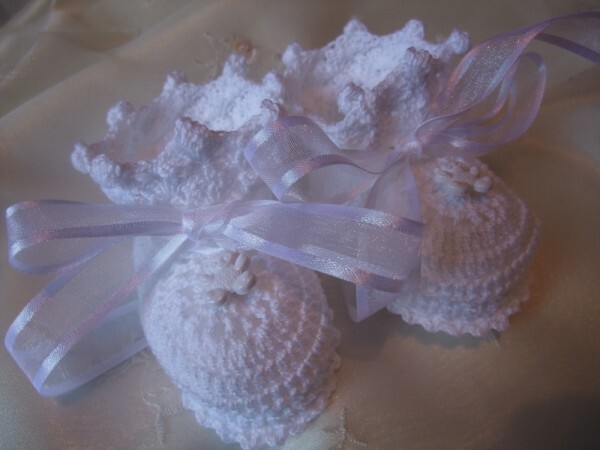 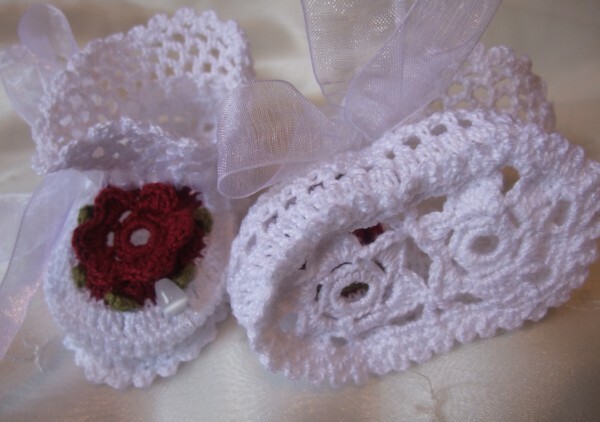 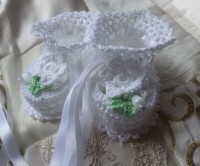 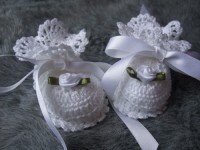 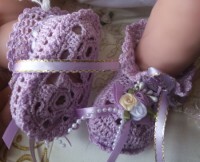 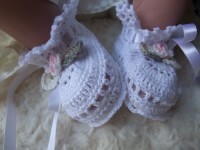 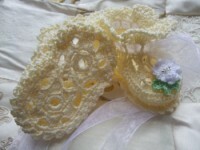 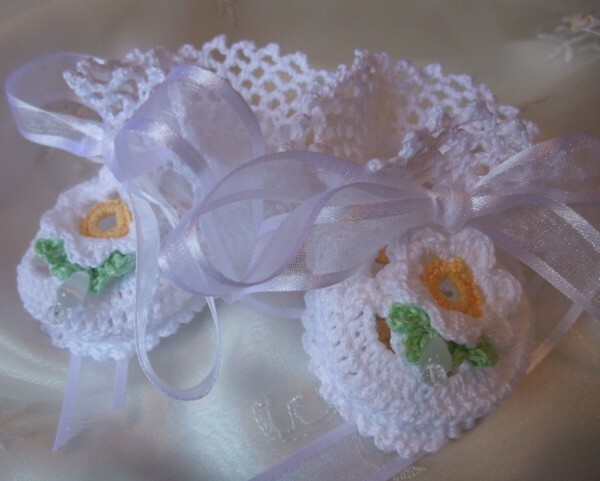 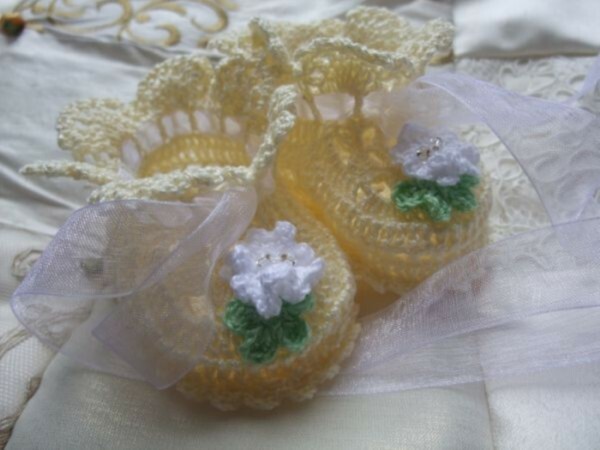 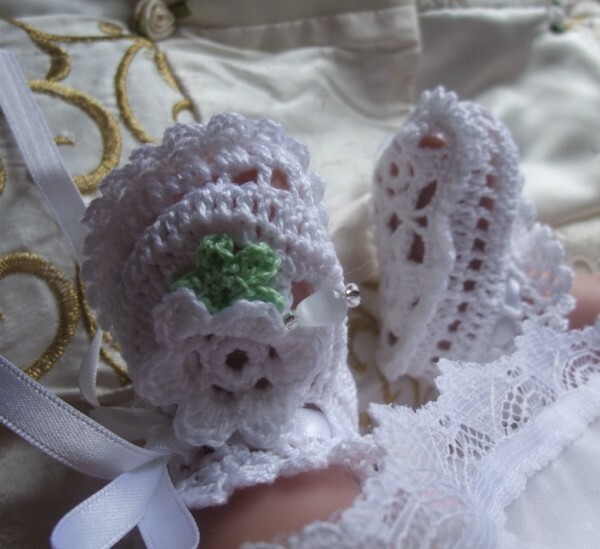 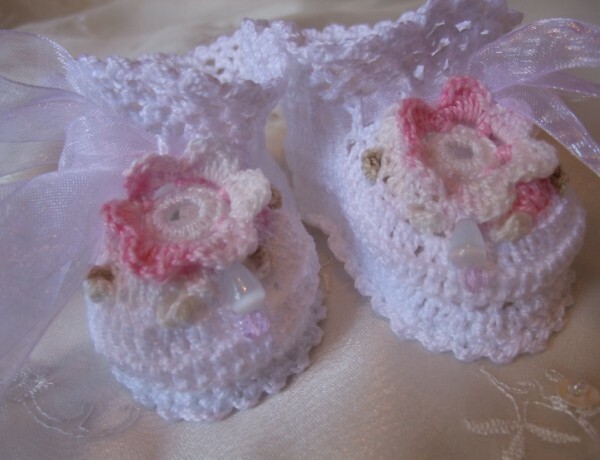 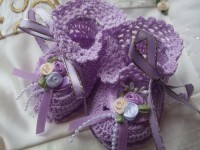 #ANGEL SHOES 005 ANGEL SHOES 005..TINY WHITE THREAD CROCHET SHOES FOR A PREMATURE BABY. 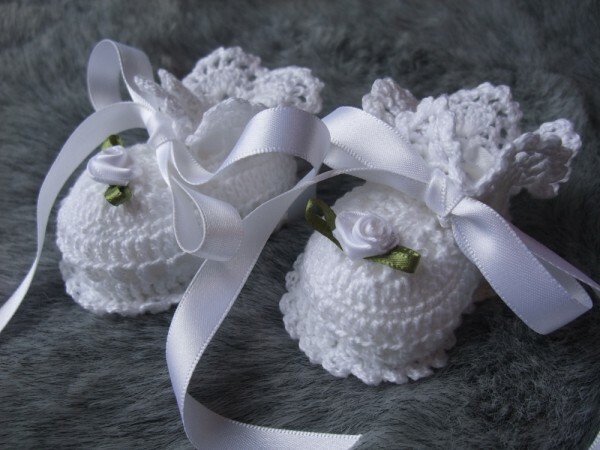 BEAUTIFUL SOFT WHITE COTTON THREAD BOOTIES SUITABLE FOR A PREMATURE BABY GIRL OR A REBORN DOLL FOR A CHRISTENING SPECIAL OCCASION OR JUST BECAUSE YOUR BABY IS VERY SPECIAL!! 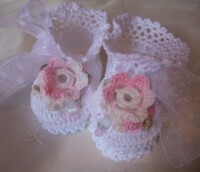 TRIMMED WITH A LITTLE SATIN ROSE AND FASTENED WITH SATIN RIBBON (DIFFERENT COLOURS ON REQUEST WITH ORDER). 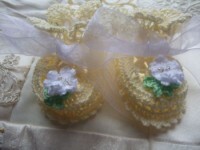 SIZE 6CMS. 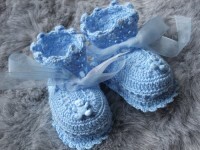 TO FIT A PREM BABY (about 3-5lb I would guess). 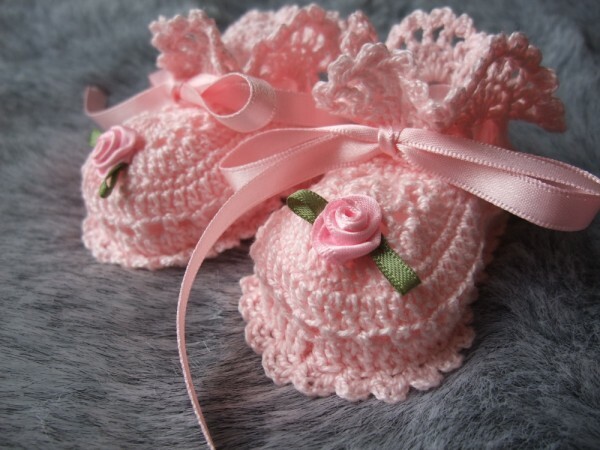 BEAUTIFUL SOFT PALEST PINK COTTON THREAD BOOTIES SUITABLE FOR A PREMATURE BABY GIRL OR A REBORN DOLL FOR A CHRISTENING SPECIAL OCCASION OR JUST BECAUSE YOUR BABY IS VERY SPECIAL!! 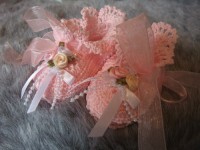 TRIMMED WITH A LITTLE SATIN ROSE AND FASTENED WITH SATIN RIBBON (DIFFERENT COLOURS ON REQUEST TO ORDER). 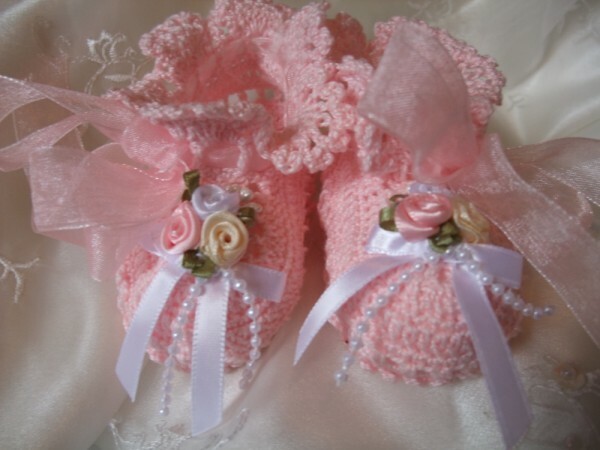 BEAUTIFUL SOFT PALEST PINK COTTON THREAD BOOTIES SUITABLE FOR A SMALL BABY GIRL OR A REBORN DOLL FOR A CHRISTENING SPECIAL OCCASION OR JUST BECAUSE YOUR BABY IS VERY SPECIAL!! 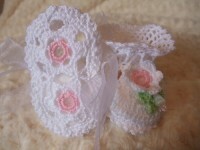 TRIMMED WITH A LITTLE SATIN ROSE AND FASTENED WITH SATIN RIBBON . TRIMMED WITH A LITTLE CROCHET ROSE AND LEAF DETAIL AND FASTENED WITH SATIN RIBBON (DIFFERENT COLOURS ON REQUEST WITH ORDER).